Pat the chicken dry with paper towels. Season with ½ teaspoon of the salt and the pepper. In a large heavy bottomed pot or Dutch oven, heat the oil over medium-high heat. 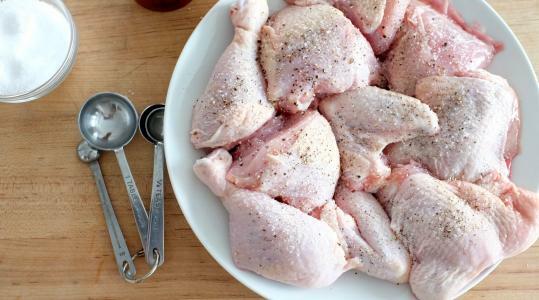 Add the chicken, skin side down, and cook until the undersides are dark golden brown (the chicken should release easily from the pot), 5 to 6 minutes. Flip the chicken and cook until the other sides are golden brown, 4 to 5 minutes. Transfer to a large plate. 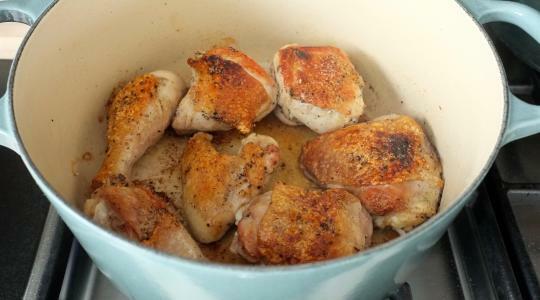 Depending on the size of your pot, you may have to cook the chicken in batches. 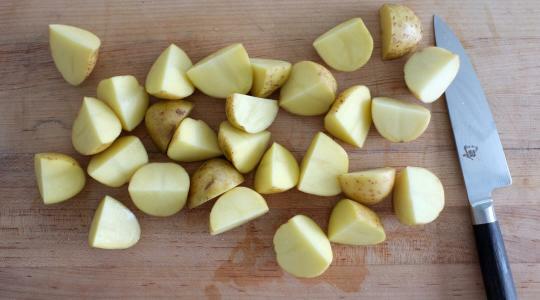 While the chicken cooks, cut the potatoes into quarters. 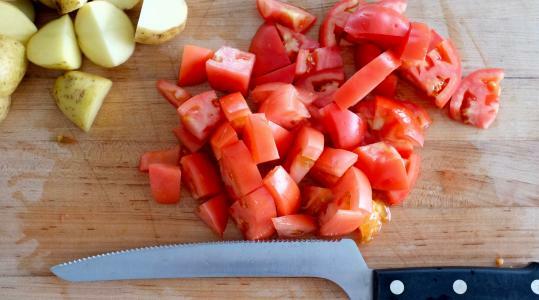 Cut the tomatoes into ½-inch thick pieces. 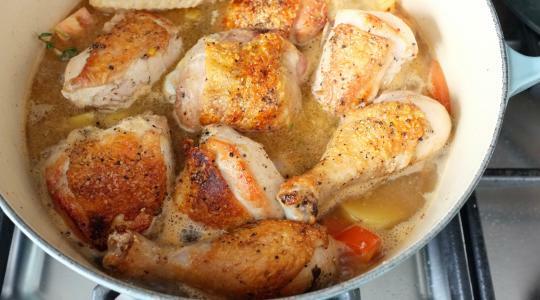 As soon as the chicken has been removed, add the garlic to the pot and cook, stirring, until the garlic is light golden brown, 1 to 2 minutes. 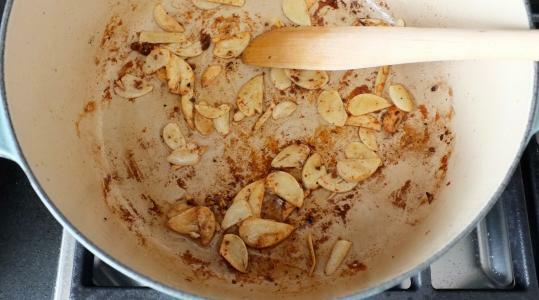 Add the sherry and, using a wooden spoon, scrape up the yummy brown bits from the bottom of the pot. 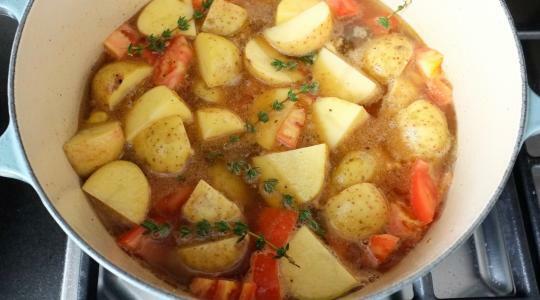 Add 2 cups of water, the potatoes, tomatoes, thyme, and the remaining ¼ teaspoon of salt. Let come to a boil. Nestle in the chicken. The potatoes should be just barely submerged but the chicken only partially- the skin should be exposed. If necessary, add a little more water. Partially cover the pot, reduce the heat to medium-low so it simmers gently. 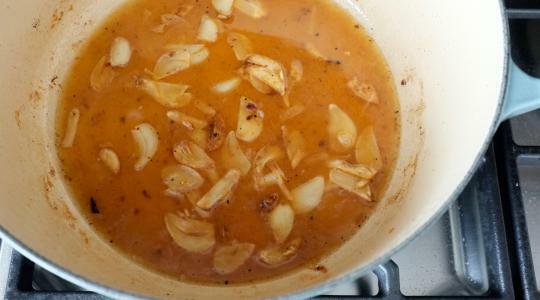 Simmer until the potatoes are tender and the chicken is cooked through, 30 to 35 minutes. Sprinkle with parsley. 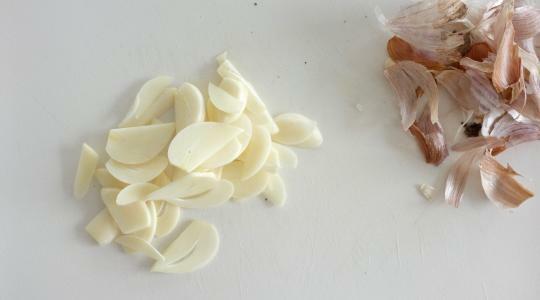 Divide the chicken and potatoes among bowls and spoon in some of the sauce. 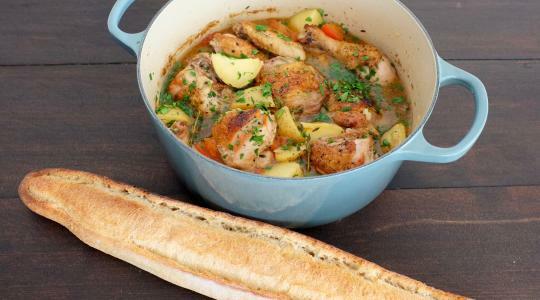 Serve with the baguette.